It’s been ten years since Marvel Studios began their epic journey that will culminate in this years Avengers: Infinity War. In that time we have been treated to 18 films, 4 TV series and 6 Netflix series, with many more on the horizon. The Marvel Cinematic Universe (MCU) was split into three ‘phases’ that would explore various characters from Marvel comics back catalogue and build the foundations of the first successful and working shared cinematic universe. Over the course of this article, we will break down each Phase and explore all of the films and the characters that populate them. We will talk about how each film fits into the wider MCU and how each instalment leads to Infinity War. 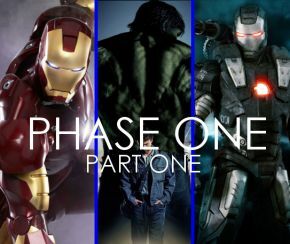 This article will be broken down to explore each Phase individually, starting at the beginning in 2008, with the first half of Phase One. The film that started it all. Iron Man told the story of Tony Stark, a genius billionaire arms dealer who, while demonstrating his latest weapons, is captured in Afghanistan by a terrorist group and forced to build them a missile. Instead, he uses his wit and skill, alongside fellow captive Yinsen, to create a mechanised suit of armour to help them escape. This first instalment was directed by Jon Favreau, who has proved time and time again to be one of the safest hands in the movie industry. He’s directed many films, from seasonal comedy Elf to the live action remakes of The Jungle Book and The Lion King. Favreau also cast himself as Tony’s friend and driver Happy Hogan, who would go on to appear in all three films. Along with the screenwriters, Marvel was able to create a realistic and grounded take on the armoured avenger, rooting his technology to scientific advancements that are incredibly close to becoming a reality, while being able to bend the rules of physics to suit the character’s needs. It’s a skill that has worked even on the most out-there franchises. When Tony returns home he upgrades his suit and puts the new model to good use by locating and destroying the weapons he created, putting people in harm’s way across the world. In a genius move, we see Stark creating his suit, making mistakes and learning from them, such as the first time he uses his thrusters, which send him hurtling into a wall. It’s not something we would normally find in a movie like this, except for Sam Raimi’s Spider-Man (2002) and Christopher Nolan’s Batman Begins (2005). Marvel took the standard superhero character and made them human and relatable. They had problems and flaws, they all have their own personality and make you care for the person under the mask. To flesh out Stark’s backstory, we are introduced to several characters who would become the staples for the Iron Man trilogy. The first is Sliding Doors’ Gwyneth Paltrow, who appears as Tony’s PA and potential love interest Pepper Potts. The second addition is the disembodied voice of brit Paul Bettany as Stark’s AI butler J.A.R.V.I.S., who can operate both inside the suit and throughout Stark’s house. He would later appear in the flesh in Avengers: Age of Ultron. It wouldn’t be a superhero film without a challenge in the shape of an antagonist, so Marvel gave us a great villain with Obadiah Stane/Iron Monger, a bigger and more pumped up version of Iron Man who wants to take over Stark Industries, played by Hollywood legend Jeff Bridges. Over the course of the film, we are introduced to the Marvel Universe in subtle ways. We meet Agent Phil Coulson, who is revealed to be working with the secret agency known as S.H.I.E.L.D. (the Strategic Homeland Intervention, Enforcement and Logistics Division.) Eagle eyed viewers spotted several references to the wider MCU such as a prototype for Captain America’s shield in Tony’s lab. But they saved the best for last. In what has become their staple for future teasing, the post credit ‘sting’ showed Stark returning home to find a shadowy figure had broken into his house. That shadowy figure: Samuel L. Jackson as Nick Fury, director of S.H.I.E.L.D. It was a momentous event that established the Marvel universe and gave the fans something they had wanted for decades: to see the heroes of Marvel comics come together on the big screen as the Avengers, and we wouldn’t have to wait long for the first crossover. Ang Lee’s Hulk failed to give fans what they had hoped for back in 2003 with a dive into the Hulk’s psyche, so Marvel and Universal Studios decided to give the green goliath another shot with the more action focused Incredible Hulk. Directed by Teenage Mutant Ninja Turtles (2014) director Louis Leterrier, the films acts as both a reboot and a sequel. It starts with a quick flashback showing Bruce Banner creating the Hulk and the manhunt that followed until he went into hiding in Brazil. Unlike the previous movie, this one focused on Banner’s hunt for a cure and his violent relationship with the army, led by William Hurt’s General Ross, which brings him into conflict with soldier Emil Blonsky aka the Abomination. The role of Bruce Banner was played by Edward Norton, who gave us a scientist cursed to live with his alter ego. A little like Dr. Jekyll and Mr. Hyde. Even though he proved an immediate favourite with fans, internal conflict resulted in Norton leaving the MCU after his one and only appearance. Many of the other actors who appeared in this film have not returned to the MCU, including Liv Tyler’s Betty Ross, the daughter of the General. Brit Tim Roth plays Emil Blonsky, as both the man and the eventual beast. Blonsky is reaching his forties and believes that a man with his knowledge combined with the body he had years ago would be unstoppable, leading to General Ross using a special serum to make him stronger. The serum is used to create super soldiers and is an attempted replication of the one that is used on a young man in the 1940’s called Steve Rogers, which turned him into the star-spangled Avenger Captain America. But this version slowly drives Blonsky insane as he hungers for more until he is later injected with Banner’s blood to make him more like the Hulk, which mutates him into the nightmarish Abomination. The Abomination is the perfect opponent for the Hulk. He is just as powerful, but is much bigger and even more violent. Just like Iron-Monger, the Abomination is a darker reflection of the hero, showing what the character would be like if they decided to use their abilities for a sinister end. The film also introduced a character from Marvel comics legend with Tim Blake Nelson starring as Samuel Sterns, who is also the Hulk’s big green headed nemesis the Leader. Even though his final scene shows droplets of Banner’s blood dripping through a cut in his head, making it begin to swell, we have still yet to see the Leader on screen, and it’s becoming increasingly obvious that we won’t. The film had several stand out set pieces that set the bar for what would come later, including a brawl on a University campus between the army and Hulk, and the final showdown between Hulk and Abomination in Harlem. This was the first movie to feature a crossover and properly confirm that all of the characters existed in the same world. At the end of the movie, General Ross meets Tony Stark to discuss the formation of a team. Even though it was revealed to be just a scenario in Marvel One-Shot: The Consultant, it was a pretty cool scene that got the audience excited for the future and Iron Man’s return. Set six months after revealing his identity to the world, Tony Stark is back, but comes under threat from the government who want to regulate Iron Man’s activity and use the technology for themselves, while at the same time trying to find a cure for a disease that is slowly killing him. Tony also has to confront a figure from his father’s past in the shape of Ivan Vanko, the son of Howard Stark’s now disgraced work partner Anton Vanko. There’s a lot to get through in the follow-up, with several subplots, character arcs and setups for the future of the MCU that somehow manage to work together and flow, but ultimately bog down the story with too much to do. Robert Downey Jr returned for the second of many appearances as the narcissistic billionaire, a role no one can see being replaced. Also returning are Gwyneth Paltrow and director John Favreau as Pepper Potts and Happy Hogan. Tony’s best friend Lieutenant Col. James ‘Rhodey’ Rhodes returned, this time played by Don Cheadle, who would continue to appear for the remainder of the MCU. Rhodey finally fulfilled his promise of “Next time, baby” as he glanced over an old Iron Man suit in the first film, by becoming War Machine. War Machine is a tanked-up silver and black version of Iron Man, with his machinery and weapons supplied by Stark Industries rival, Hammer Industries. Sam Rockwell stars as Justin Hammer, and he quickly became one of the best villains of the MCU. He isn’t out to take over the world, but instead trying to make Iron Man look like an antique by building his own suits for the US armed forces. As with most sequels, the story focused on a more personal plot, with Tony being poisoned by the arc reactor in his chest, forcing him put his affairs in order, such as giving Pepper ownership of Stark Industries. The villain of the piece is Mickey Rourke’s Ivan Vanko aka Whiplash, who uses his own arc reactor technology to create two electrical whips and attempts to exact revenge on Tony for what his father did to his family. Even though Vanko is just as smart as Tony, he doesn’t have much personality and serves as a plot device to get Tony to suit up. Unfortunately, he is the first of a few one-dimensional villains that led to something critics refer to as Marvel’s ‘villain problem’, even though it isn’t exclusive to them, with many recent big budget villains proving to be just as bland, arguably worse. Iron Man 2 acted as the big set up for The Avengers, establishing multiple elements that would feature more prominently later on, such as the first appearance of Scarlett Johannson’s slinky super spy Natasha Romanoff aka the Black Widow and a more prominent role for Samuel L. Jackson’s Nick Fury. Agent Coulson also appears briefly before jetting off to New Mexico, the Land of Enchantment. Over the film we get to see plenty of references to the wider universe, with a quick shot of a prototype for Captain America’s shield, news footage from the campus brawl in The Incredible Hulk, and a map of the world with several points of interest, including the middle of the Atlantic and even the elusive nation of Wakanda in Africa. The post credit scene was a small clip from the next movie on Marvel’s slate, showing Agent Coulson pulling up in his car besides a large crater in New Mexico. He informs his senior that they have “found it”, before the big reveal of a large hammer known as Mjolnir. Part 2 of The Road to Infinity War: Phase One is available to read here.